It’s been a long day. My companion for the day was Alex–he didn’t go to school. His cough was bad enough this morning that I decided to wait and see if sitting up would help. It did, but then he slept most of the morning. He lazed around for most of the rest of the day, only really getting up to build some Lego with my best friend, John. He’s sleeping again now–the worry isn’t over. I look forward to going back to this not being the only thing on my mind. “Companionship” is the prompt word for today, brought to us by Di. Thanks, Di! Click here to find her JusJoJan post for today. And say hi while you’re there! 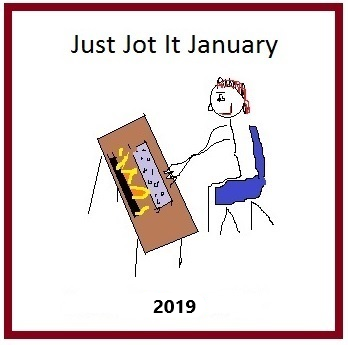 Categories: Blogging, Blogs, Just Jot it January 2019, Life, Parenting | Tags: children, family, Health concerns, inspiration, JusJoJan, worry, writing prompt | Permalink. Glad Alex has you for a mom and has the chance to rest until he is more healthy. Meanwhile, as everyone above says, I hope you get some rest and all will be normal again for you. I hope Alex feels better soon! Boo to Alex still having a cough. Sending healing vibes. Yay to companionship and him getting some sleep. Thanks, Jill. He’s still sleeping a lot. Not sure if there’s something else going on now or if he’s just catching up. I hope Alex turns the corner soon and gets over this gunk. Hope Alex is better today. hugs! worry is awful! I hope he’s going to be well soon again! How exhausting for you. So sorry you have to go through this alone. Please take care of yourself!